I’m constantly looking for new flavor combinations to keep my salads fresh and exciting for my guests. New Hellmann’s Salad Dressings provide a range of bold new flavors to unleash your salad creativity. Water, soybean oil, vinegar (distilled, red wine), sugar, salt, dehydrated onion, dehydrated garlic, natural flavors, lemon juice concentrate, oregano, xanthan gum, spice, onion powder, sorbic acid and calcium disodium edta (used to protect quality), black pepper, lemon peel, sesame seeds, marjoram. 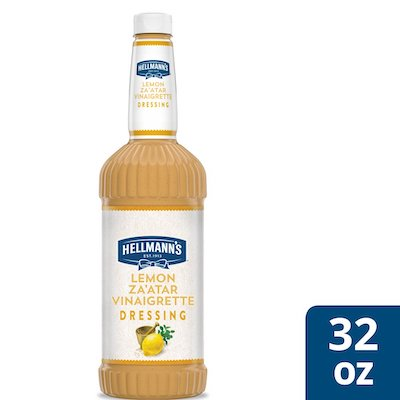 Add more variety to your menu and introduce your guests to vibrant new flavors with Hellmann’s Lemon Za’atar Salad Dressing. Made with real za’atar seasoning and inspired by culinary trends of Middle Eastern cuisine, this vinaigrette salad dressing offers a flavorful, unique alternative to more traditional dressing choices. It clings exceptionally well to green salads, makes a great accompaniment for grain bowls, and can also serve as an ingredient in dips, marinades, and more. Ready to use. If safety seal is missing, do not use. Specially developed for use in restaurants and other foodservice applications, this gluten-free salad dressing offers versatility and texture that chefs can rely on. It contains no artificial flavors or colors, no added MSG, and no high-fructose corn syrup, offering a wholesome recipe that you and your guests can trust. A perfect addition to any salad bar, it comes packaged in convenient salad dressing bottles to enable easy self-service. Comes in a bulk salad dressing container; contains no artificial flavors or added MSG; vegetarian and gluten-free.